My Audi A3 was a bit battered but I loved it. I particularly liked the fact that it was extremely fuel efficient, whilst also being quite speedy. Although, my sons complained that I drive too slowly and so didn’t make the most of this quality. One of the few problems with the Audi was it being very low slung. On one occasion I damaged the sump on a particularly vicious speed bump. And the final blow was also directed at the car’s under-carriage. On the out-skirts of Bristol, the road was being repaired. They’d taken the top off it but left a drain cover sticking up. Bang. When I hit it the air bag went off and smoke filled my car. I got quite a shock. I discovered that I wasn’t the first person to have done this – and suspect that there were a few more casualties before the road was repaired. But the damage to my car was probably the most serious – it ripped the bottom off it. And my insurance company confirmed it was a write-off. Eek – that meant finding a replacement. My first stop was The Green Car Guide. 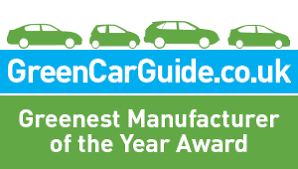 They give detailed information on the green credentials of new cars. The problem for me was that I planned to buy a second-hand one. However, I discovered that the guide had been set up in 2006, and so has information going back until then. And I got in touch with Paul Clarke, the founder and editor, of the Green Car Guide, who was very helpful. Another useful website is the VCA Car Fuel Data. Set up by the government, this provides detailed information on fuel consumption and CO2 emissions of cars – both old and new. One thing I was confused about was the fact that CO2 emissions didn’t appear to correlate with fuel efficiency. Actually, they do, but it’s different for petrol and diesel cars. For example, the Toyota Urban Cruiser has a petrol and diesel version with pretty identical CO2 emissions – 129 g/km for the petrol and 130 g/km for the diesel model. But the fuel consumption for the petrol model is 51.4, whilst the diesel is 57.7. Going back to my search. My criteria was for a four door, diesel, that was reliable, safe and as ‘green’ as possible! I need a family car, which a bit of space, as I have three teenage sons – or nearly teen as the youngest is actually 12. So we started looking on eBay. Found a Volvo V50 that looked like it would fit the bill. It was 1.6 litre and 2007 model. And it’s fuel efficiency looked pretty good at 56.5 mpg average and up to 65.7 mpg for what’s called ‘extra urban’. Fetching the car proved a bit of an adventure. I got severely delayed on a train to Tunbridge Wells because of the snow. The following day, the friends I was staying with very kindly drove me in a 4-wheel drive to Horsham, where the car was sitting in a snow-covered forecourt. After a night in Woking and a drive down the M3, I managed to get close to home – walking the last few hundred yards. As I write the car has been snowed in for several days. My driveway is an icy slope. But I’ve been testing its fuel-efficiency on the journeys I’ve taken. Long distance I’ve managed 55mpg and on everyday journeys nearly 40mpg. Not as good as the official figures, but I’ve learnt from experience that this is normal. I’m thrilled with my Volvo. It may not be quite as zippy as the Audi but it does have 4 doors and one real luxury in this weather – heated seats! This entry was posted in About me, BLOG, News 2010, Transport - Road, Rail & Air. Bookmark the permalink. This is my first time i visit here. I found so many interesting stuff in your blog especially its discussion. From the tons of comments on your articles, I guess I am not the only one having all the enjoyment here! keep up the good work..
Good for you to see the Volvo V50! It has good fuel-efficiency, making it perfect for long trips across the country. Also, the heated seats are definitely a big plus! It's just wonderful to feel warm inside the car while the snow falls down outside.